ST PATRICK’S Day takes place on March 17 and all around the world people will be getting into the spirit of all things green and Irish. Thanks largely to the number of Irish pubs around the world you’ll never be too far from one of these celebrations, but if you’re not too clear what to do and where to go here’s a few ideas for places around Asia. Hot and steamy Kuala Lumpur loves to do things big and bold. This year they plan to host the largest St Patrick’s Day celebration in Asia. Last year 8,000 people attended their street parties over the celebratory weekend. This year they are determined to make it huge and have made all of March a celebration. They also want your help to make it the best and are asking you to do two things – come to their street party at Changkat Bukit Bintang on March 16-17 and make an online pledge so they are recognised by the Guinness World Records. As you probably know Singapore has some strong connections to the British isles and they also have a St. Patrick’s Society. Put two and two together and you get events such as the Annual St. Patrick’s Day Ball and St. Patrick’s Day Parade. The ball is held on March 16 from 7pm and requires a ticket. The parade is free and is a sea of green, bands, bagpipes, costumes and fun. For a full Irish immersion join the fun at 3pm on March 18 from Empress Place and wind across the Singapore River to UOB Plaza. From there the parade turns into a street party outside Irish pubs like Molly Malone’s where you can get a pint or two of Guinness. For other Irish celebrations over the weekend click here. 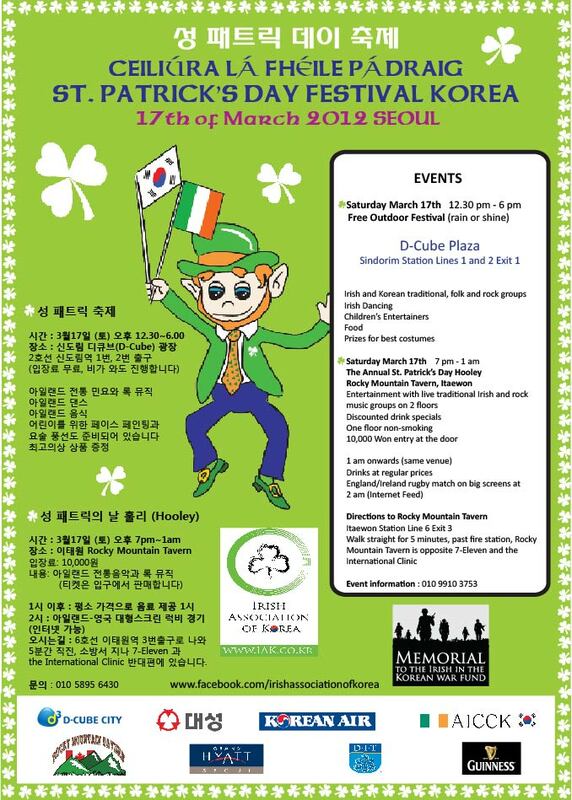 The Koreans love a good excuse for a party and the Irish Association of Korea has been celebrating St Patrick’s Day annually since 2001. Their Seoul parades regularly attract close to 15,000 spectators. This year it’s the 12th event and they’re expecting just as many again. Activities will get underway on Saturday March 17 in the D-Cube Plaza, Sindorim from 12.30pm to 6pm and it’s free. Expect army bands, folk dancing, singing, Gaelic football and plenty of Guinness. It might be a heck of a long way from Tipperary, but the Japanese have embraced the Celtic cultural celebrations of St. Patrick’s Day for many years. Last year the parades were cancelled given the devastation of the tsunami and nuclear crisis. However the wonderful annual parade attracting 2000 participants and 30,000 spectators is expected back on the streets of the capital this year with plenty of green, Irish dancing, marching bands and Guinness to boot. The madness will get underway on March 18th at 2pm at Omotesando – Harajuku. The Japanese Irish network has a long list of events associated with St. Patrick’s Day all around the country. There have always been tons of Irish people in Australia and the love affair with the Emerald Isle that really cranks up around St. Patrick’s Day. In fact celebrations of the beloved saint and Irish heritage have taken place here since 1810. The Sydney parades are the biggest in the country and the third largest in the world. Sydney loves to do things in style so don’t miss the action. The parade starts from Town Hall at midday with floats, bands and participants heading off down George St, Bathurst St, Park St and Elizabeth St to finish at Hyde Park. Festivities continue at Hyde Park until 6.30pm with plenty of fun for kids and families. An annual Australian citizenship ceremony is also held here on the day. From there of course action will continue in the numerous Irish pubs around the city. Sydney never sleeps so you’re guaranteed a good night out. The Sydney Opera House will also light its sails in green to mark the event. For more events abroad click here.